Pakistan’s support of regional proxies throughout Central and Southwest Asia is at long last sounding alarm bells throughout the international community. With an uptick in violence in Afghanistan and Pakistan’s support of the Haqqani Network, international actors may finally be saying enough is enough. 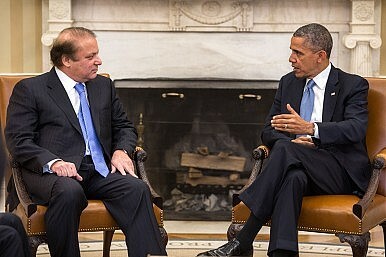 A growing chorus of states from the United States to China appears to be shifting away from Pakistan, or at a minimum making overtures to pressure Pakistan into ending support of terrorist groups in the region. This summer the United States blocked sales of F-16 fighter jets to the Pakistani military, and in August ended $300 million in aid to Pakistan’s military that is set aside for allies fighting the war on terror after U.S. Secretary of Defense Ashton Carter refused to testify to Congress that Pakistan was combating terror groups inside the country. Moreover, the United States has started to shift Afghanistan toward India’s sphere of influence, with Ashraf Ghani currently in the country on a two day state visit to conclude bilateral defense agreements that will assist Afghanistan’s fledgling air force. China appears to be making similar gestures, or at least putting some heat on Pakistan. After the G20 Summit in China last week, India’s Prime Minister Narendra Modi expressed concern over the China-Pakistan Economic Cooridor (CPEC), a $46 billion dollar project designed to connect China’s Kashgar to the Pakistani port of Gwadar. The project is also expected to greatly modernize Pakistan’s infrastructure and boost the economy. The Global Times ran an article highlighting the importance of the CPEC project to both Paksitan and China’s “One Belt, One Road” initiative but underscored the problems and costs associated to security to maintain and develop the project. “It is unlikely that China will change its supportive attitude on the CPEC in the short term, but the increasing cost of security is becoming a big problem in efficiently pushing forward the project,” the paper stated. Furthermore, the Global Times article indicated China may pivot its attention away from Pakistan toward Southeast Asia, as it tries to amend fears over its activity in the South China Sea. “The CPEC has long been seen as a flagship project in China’s Belt and Road initiative, but the initiative’s strategic focus may need to shift gradually toward Southeast Asia, where there is a wide infrastructure funding gap but a relatively stable regional environment that will enable China to efficiently push forward ventures under the Belt and Road initiative,” the article predicted. Regional actors appear to be applying pressure on Pakistan to change its behavior with regards to supporting proxy agents throughout Central and Southwest Asia. Pakistan’s response to that pressure in the short run has been to seek out ties with Russia. It was announced this week that Pakistan and Russia will hold their first ever joint military drills later this year. The move comes as Pakistan is also considering buying advanced military equipment from Russia. China's habit of blocking Indian moves on Pakistan-based terrorism at the United Nations continues. Testing Pakistani Prime Minister Imran Khan’s ‘Independent’ MindThe Geopolitical Implications of Imran Khan's Rise in PakistanHow Will a Prime Minister Imran Khan Steer Pakistani Foreign Policy?Is There Hope for Resurrecting India-Pakistan Relations?What Will the Trump Administration's Decision to Withhold Aid From Pakistan Really Accomplish?